SAMMY Ameobi wants to make Newcastle fans forget about the club’s inability to land senior recruits this summer. The younger Ameobi brother is set to benefit from United failing to secure a striker in the close season with an increased number of starts – beginning tonight at Old Trafford. “Of course I know what the supporters think,” he said. “I know that a lot of them weren’t too happy at the fact that we didn’t get more players in the summer, but this is our opportunity to show that we’re good enough. “We have got enough strength in our squad to get through games like this. With Wayne Rooney set to return for the Red Devils it promises to be a major test for a young Newcastle side. “Manchester United will be very tough. 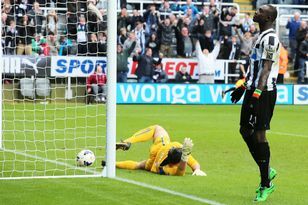 It’s a tough draw for us,” Ameobi said. “For young players like myself this is a big, big opportunity. We all believe that we’re good enough and I have always said that we have a group of young players that are capable of performing well but now we have to prove it. UNDER Alan Pardew, Newcastle United’s players are nothing if not well prepared. ECHOING another former Toon hero, Tommy Cassidy would “love it” if Blyth Spartans gain a result at Workington on Tuesday.